Ella Rhodes reports on the BPS presence. The Society organised fringe events at all three of the main political party conferences this autumn, aiming to raise the profile of the Society, align it with key themes that are high on the political agenda, and highlight the contribution psychology can make to sound and effective policy responses. 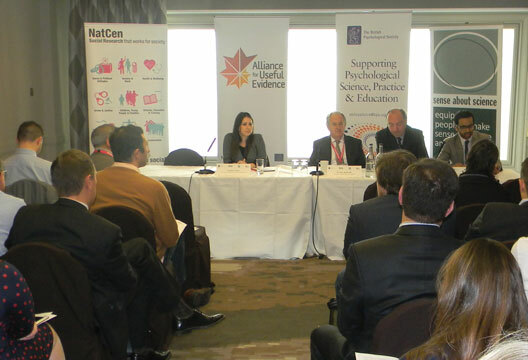 At the Labour Party conference in Manchester the Society’s Policy Team co-organised a fringe event with the British Association for Counselling and Psychotherapy (BACP), which focused on the topic of how to deliver psychological therapies in the context of Labour’s vision of whole-person care. Professor Jamie Hacker Hughes, the Society’s President-Elect, spoke at the event, which also heard from Chris Ruane MP, Kevan Jones MP, Baroness Hollins (BMA), Ian Hulatt (Royal College of Nursing) and Dame Sue Bailey (BACP). At the Conservative Party conference held in Birmingham, the Society organised a fringe event concerning evidence-based crime policy. This event was held in close cooperation with the Society’s partner organisations: Sense about Science and the Alliance for Useful Evidence (AfUE), along with NatCen Social Research. Attendees also heard from Katy Bourne, the Sussex Police and Crime Commissioner, who gave an interesting account of the challenges in applying new, evidence-based policy and practice, but how this is something Sussex Police are implementing. The Society’s Lead Policy Advisor, Dr Lisa Morrison Coulthard, spoke to highlight examples of psychological research that have informed good practice policing in the UK and abroad. These were refinements in facial composite production systems and associated procedures, identification parades and the policing of crowds. The Society’s fringe event at the Liberal Democrat Party conference was themed along the same lines of the fringe event at the Conservative Party conference. The event was held in cooperation with the Society’s partner organisations Sense about Science and the Alliance for Useful Evidence (AfUE). It was chaired by Sir Alan Beith, Chair of the House of Commons Justice Committee, who spoke on the topic of crime reduction. The event also heard from Norman Baker, the then Minister of State for Crime Prevention. In addition to organising these events at the party conferences, Policy Team staff were also invited to key roundtable meetings and also attended meetings with political contacts and kindred organisations at the party conferences. These meetings offered a valuable means to gain a direct insight into current party thinking and for Society staff to highlight the contribution psychology research and practice can make to key policy challenges. Examples of significant Society activity that staff were able to highlight during these meetings include: behaviour change, brain injury and the criminal justice system, mental health, end-of-life care, examples of impactful psychology research and interventions for those with dementia. Policy Team staff are following up with the political speakers from these events and the political contacts and third-sector representatives with whom they met to both strengthen ties and explore options for the further dissemination of psychology research and practice.